This is not good. The only thing standing between my wallet and the more than 2,000 cards in the Final Fantasy Trading Card Game was all of that Japanese text. Now Square Enix is launching the game in English. On October 28. Great. For nearly six years, Japanese Final Fantasy fans have been greedily devouring booster packs of cards featuring art from the likes of Tetsuya Nomura, Yoshitaka Amano and Akihiko Yoshida—bright and colorful cardstock coated with images of their favorite characters from the franchise. Western fans eager to play the game themselves have been importing cards and doing fan translations for years. Those poor bastards will have even more to buy now. Launching in Europe and North America on October 28, the English version of the Final Fantasy Trading Card Game is starting us off mercifully slow. The first set, Opus 1, features only 216 cards, which doesn’t seem like much at all! I can probably afford that. 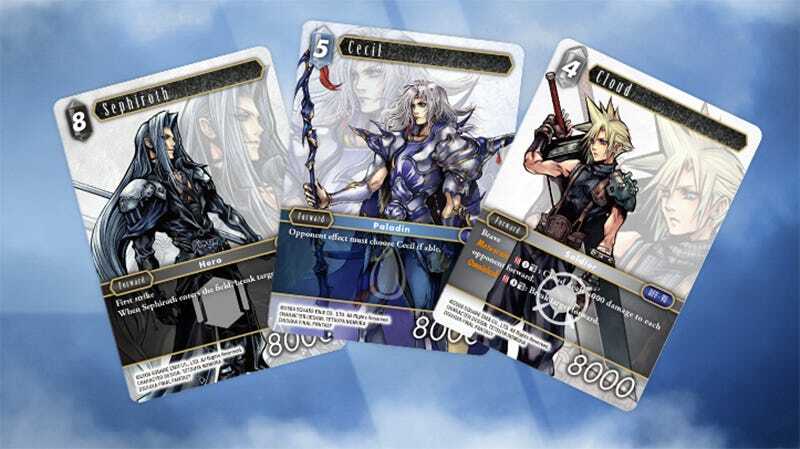 The set features brand-new cards featuring characters and art from the Final Fantasy VII Remake, Dissidia and World of Final Fantasy, and each card in the set will have a premium foil counterpart. Of all the characters to put on the first set, they chose Lightning. Okay. Via the Final Fantasy Twitter. Wait, so that’s 432 cards. A set to play, and a set to collect? And of course you can’t build a deck with just one of each card. Oh god. This is going to hurt. Starter sets, featuring Cloud, Tidus and Lightning. The official Final Fantasy Trading Card Game website has tutorials and other goodies to help us prepare for the impending release. May cards have mercy on our souls.